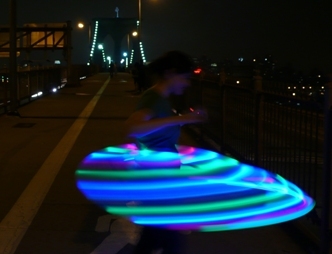 Mini LED Hula Hoop – The Finger Hoop! I hate to say it, but this little thing is cooler than my full size hoop. I can’t put it down. The spiral light trail puts me into a trance as it flows to the outer edge of the hoop and back down to the center around my finger. So what do I call it? Is it a mini-hoop? or more like a finger-hoop? What should I call my miniature LED hula hoop? So it IS SO FUN, and mezmerizing, and beautiful*** and it IS a Fingerhoop!! No doubt about it, check it out there is even a group on TRIBE dedicated to the fine art of Finger Hooping called Finger Hoop Nation. Call it an LED finger hoop! oh yeah forgot the specs. The diameter is about 11 inches. Next time I’d probably go for an even 10 or 12. But I made this in like 20 minutes. the thickness is only 1/2 inch. now I gotta find a good source for tiny batteries and a way to get more than one LED down there, maybe only two, each at opposite ends. then gotta add a switch. I might release a kit of parts for others to make, or maybe I’ll just make them myself? Same type of LED, this in particular was Aqua Green color. The only difference is that there is just one light instead of 12 or 21 etc. The tubing is obviously a lot thinner. 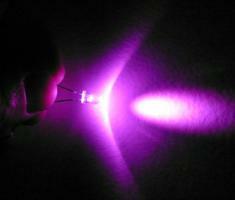 And the hoop sticks to my finger pretty well so it makes the LED follow a true spiral pattern.